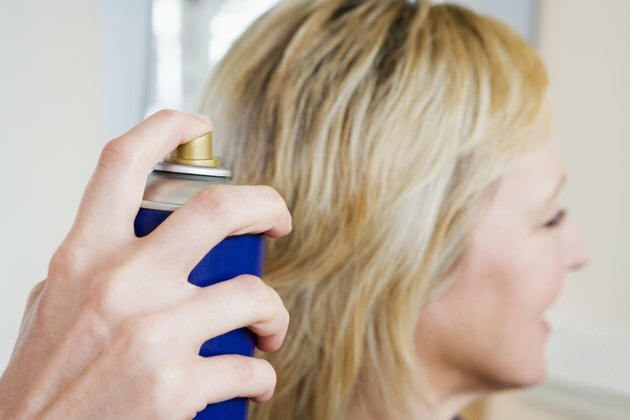 As you style your hair, tiny droplets of hair spray become airborne and land on your bathroom tile floor. As these droplets dry, they become sticky and leave a tacky feeling on the tiles. The stickiness serves as a magnet for dirt, dust and debris, eventually causing a dirty tile floor. Sticky hair spray stains can be difficult to remove but need not be a permanent stain on your flooring. Use supplies likely found around your home to remove hair spray stains. Sticky hair spray leaves tacky stains on your bathroom floor. Place 2 tbsp. of water in a bowl, add 1 tbsp. of liquid fabric softener and stir. Dip a clean cloth in the fabric softener solution and wipe over the hair spray stain on the tile. Let the solution sit for two minutes to soften the stain. Scrub the floor tiles with the fabric softener and cloth. Wipe dry with another cloth. Moisten another cloth with rubbing alcohol and rub the remaining sticky hair spray residue to remove it. Pour a quarter-sized amount of vinegar onto a clean cloth. Clean your bathroom tiles with the vinegar to remove any slippery residue left by the fabric softener solution. Dry the tiles with a clean cloth.